The third annual Market on the Square returns to Cincinnati’s central gathering point this Tuesday, May 4th. The seasonal market attracts hundreds of shoppers and visitors to Fountain Square every Tuesday afternoon through the summer months. 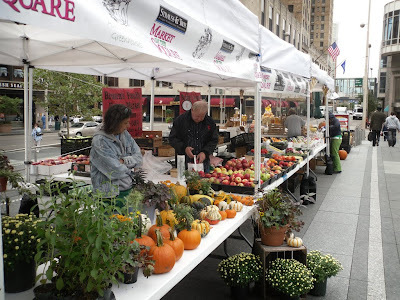 The Fountain Square Management Group has announced that this year’s Strauss & Troy Market on the Square will include 20 different vendors and has been extended four weeks running from Tuesday, May 4 through Tuesday, September 28 between 11am and 2pm. This year’s vendors will be selling produce, bakery goods, ready-to-eat foods, flowers/plants, jewelry and some other select items. Fountain Square (map) is easily accessible by bike, Metro bus service (plan your trip) and automobile with daily parking available directly underneath the square in the Fountain Square Parking Garage. Market on the Square photo by Thadd Fiala.